A building site manager at Swindon based Hills Homes Developments is celebrating after being presented with a Performance Beyond Compliance certificate from the national Considerate Constructor’s Scheme (CCS). Ahmet Ibrahim manages the construction site at ‘The Rozzers’ housing development in Bibury, Gloucestershire, where 11 new homes are being built on behalf of Cirencester Housing Association to provide affordable housing for local people. The CCS assesses construction sites on the following five categories in the Scheme’s Code of Considerate Practice: Site appearance, respect the community, protect the environment, secure everyone’s safety, and value the workforce. Sites are not only assessed for compliance, but also to identify measures taken which are above and beyond these requirements, with a score of 10 in each section being the highest achievable. 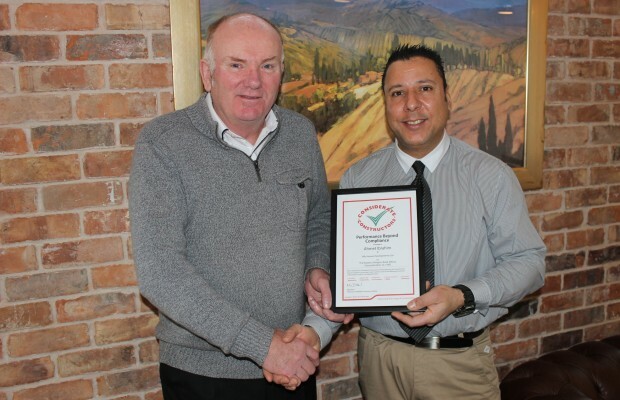 Pictured above: John Doody, production manager for Hills Homes, congratulating Ahmet Ibrahim.